My kids go to a school with a high percentage of muslims, and our neighboring town is nearly a majority muslim. My wife is not a kid attending the school. She teaches there. You did not answer the question. Nobody has. You voted for one to be our president. Saudi Arabia does pretty much does the same thing, yet this administration is giving selling them nuclear power technology and assistance…where’s your outrage? Not only that but Saudi Arabia was recently condemned at the UN Human Rights Council for the uptick in human rights violations since the new crown prince took power…ironically this happened AFTER Trump removed the US from that council. And we know Trump was all over condemning them for Khashoggi’s murder…right? I realize your wife is not a student. I was pointing out I live and participate in a school community in school with lots of muslims. No one has ever done that. Do you have a link to this claim of yours? Something from a local paper? If it’s true, I would NOT support the school bowing to that pressure. But frankly, based on my experience with muslims in our school districts, I don’t believe it’s a true story. 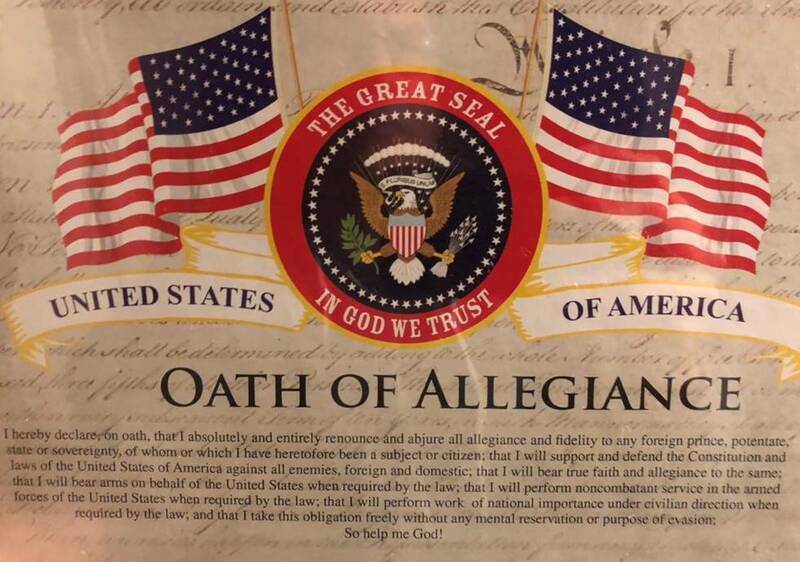 We already do this, it’s a called an Oath of Allegiance during naturalization ceremony. I agree with you. There a plenty of things that the Islamic world does to cause outrage. Why no outrage over the trump administration selling, giving SA nuclear technology? Oh yeah, that’s why she insisted and got the 100’s of years of Congressional rules changed so she could wear her Sharia law hijab. That’s just the opposite of assimilation, it’s the height of insult to our rule of law, our traditions, America and American values. we have lots of “traditions” that have been changed here in the United States. Slavery was “traditionally” tolerated by Americans (save for my ancestors who were ardent abolitionists) tradition abolished by 13th Amendment. woman not being enfranchised in America was “traditionally” tolerated by Americans. (save for my ancestors who where suffragettes). tradition abolished in 1920.
some traditions need to die. And Rep. Omar took care of one of them this year. No, she is filled with hate which attracts hate! The Bible doesn’t teach to hate non- Christens like the Koran does. Wow, you actually support her hate, sad! If you think there are millions of Muslims living in the USA that would support gay rights, I’ve got a bridge in Brooklyn for sale! You don’t have Christians slaughtering gays throughout the world but there are PLENTY of Muslim countries that do just that! Comparing devout Christian who won’t bake a cake or take pictures at a gay wedding as equivalent to what radical Islamic Sharia law countries do to gays is really “far out” of the realm of harsh reality! Because that would be a deflection from the topic of Muslim assimilation. With all due respect, this reply looks like a game of gotcha. This is not a general condemnation of the Islamic world. I make exception for murder and torture. But. If you start a thread regarding this topic, I will give you my view. I promise! They know this. But under the rules of liberal groupthink, they are not allowed to say it. Is it a competition? Or are they both incredibly flawed? Damning people to hell is not hateful?